Eco Stock was covered on Newshub, which gave us an opportunity to showcase our existing animal feed operations and outline our plans for the anaerobic digestion of foodwaste. Eco Stock are proud to announce that we received a Judges Commendation in the "Going Circular" category at the Sustainable Business Network Awards. It was a great night, with a number of Ministers, local government and industry players attending. See the coverage of Eco Stock in this NZ Herald article. "The Auckland business deals with eight double-decker buses of food waste every day - seven days a week." 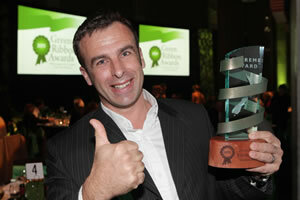 For more information, see the Sustainable Business Networks Awards site. Eco Stock is delighted to announce that we have received a grant of $12,000 from Auckland Council’s Waste Minimisation Fund to enhance our de-packing of surplus food. This grant will go towards specialised de-packing equipment that allows us to effectively access surplus food that would otherwise have gone to landfill. Such support is greatly appreciated and we thank Auckland Council for reducing the volumes of food going to landfill. Ecostock has a new home at 35 Hobill Ave (otherwise known as 43C), having moved from its previous location at Aerovista Place. This site provides significantly more room and is close to our food manufacturing customers. Fuelling dairy cows on high-end rations created from food waste has put Auckland's EcoStock in the running for a million-dollar business prize. EcoStock is one of five finalists in the University of Auckland Business School Entrepreneurs' Challenge who will find out if their pitch for growth funding has hit the mark in the Dragon's Den-style competition on Thursday. 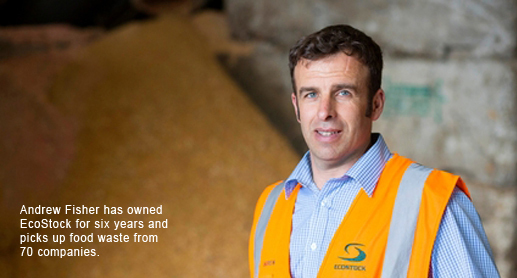 EcoStock takes around 150 tonnes a day of food waste normally destined for the landfill and turns it into nutritionally balanced stock food to be fed alongside maize, silage, molasses and other supplementary feed. Managing Director, Andrew Fisher, says it's the "unsexiest" business in New Zealand. In the six years since he bought the business Fisher has increased the staff from two to 36, runs 13 trucks and picks up anything from vegetables to chocolate bars from 70 food companies. Even the most efficient food producer will have up to a 5 per cent food waste rate, said Fisher. This included incorrect recipes, machinery malfunctions, damaged packaging or expired stock. Food waste is then processed under the watchful eye of the Ministry for Primary Industries and two nutritionists into stock food for a select group of farmers. Any spoiled products are composted. "You look at a pallet of boxed products; traditionally that would have gone to landfill and may have cost the client $200 to take that pallet. "We'll take that pallet, we'll probably buy it off them and the cardboard will be recycled, the plastic will be recycled, the wooden pallet will be recycled, the food inside it is recovered. "You're probably looking at maybe 1 per cent goes to landfill, but then that is a big change in the whole dynamics." Fisher said the Entrepreneurs' Challenge could help boost business growth on several fronts. Funding would be directed towards a flagship site for the company in Auckland that could be replicated around New Zealand and Australia. He has offered up part of the site as a research facility for the University of Auckland to help speed up the commercialisation of science-and-engineering-based technology around food production, packaging and recycling. "If we can bring some technologies through us, front the university to some of our food manufacturers, you're going to see a huge growth in some of our high value, value-added food exporting that New Zealand is all about." Fisher is also keen to connect with New Zealand's business big hitters to get a behind-the-scenes look at how successful large enterprises function. Making Money and helping the environment needn't be a contradiction. New light has been thrown on the size and makeup of the green economy, with the creation of a list that ranks New Zealand companies helping the environment. 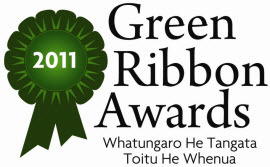 The winners of the 2011 Green Ribbon Awards were announced by the Minister for the Environment, Hon Dr Nick Smith on 9 June 2011. The ceremony, held at Parliament was attended by 150 guests including the Green Ribbon Award finalists. EcoStock Supplies is a small business making a difference in waste minimisation by turning food waste into a high quality food product for livestock. EcoStock Supplies collect food waste from processors, retailers, importers, and transport companies, and instead of going to landfill, it is processed into high-quality stock food at their plant in South Auckland.